Our third entry in the 2012 Seashells and Sunflowers Argentine Recipe Contest comes courtesy of Ana Astri-O'Reilly, author of the blog Ana Travels. 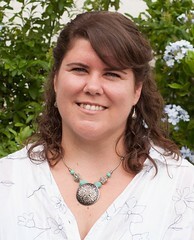 Ana is a native of Buenos Aires, but she currently lives in Dallas, Texas, USA with her British hubby. This is one of my mum's go-to recipes. She usually makes it for Christmas because it can be prepared in advance and is eaten at room temperature, which is great since it can get quite warm in December. 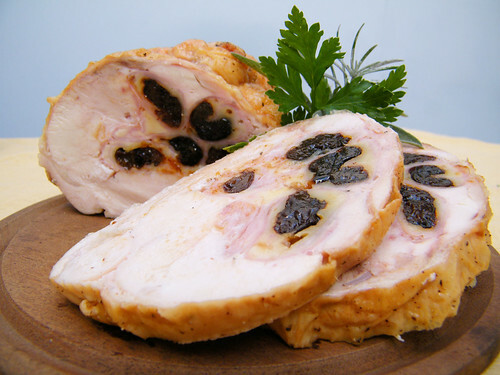 As Ana mentioned, pollo relleno (also called arrollado de pollo or matambre de pollo) is a popular option for cold buffets at the holidays. Like other southern hemisphere dwellers, Argentine families celebrate Christmas and New Year's in summertime, and so, many opt for dishes like salads and platters of cold meats at their parties and get-togethers at this time of year. I tried this dish both hot and cold, and I enjoyed it both ways. If you choose to serve it Argentine-style, take it out of the fridge a bit ahead of time so it's not stone cold. I loved the simplicity of Ana's (or rather, Inés') recipe. It's perfect for entertaining because it doesn't take a lot of effort to prepare yet looks impressive. 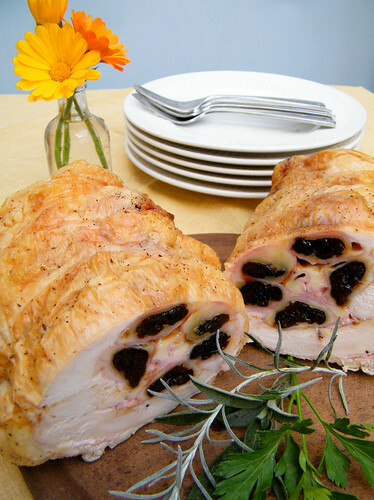 The prunes provide a touch of sweetness to balance out the saltiness of the ham, and if you like, you can use a sharp cheese to further boost the flavor. Place the chicken skin-side down on a clean work surface, and season with salt and pepper. Top each slice of ham with a slice of cheese and a prune, and roll up [Note: I put three prunes in each roll-up]. Line up the ham rolls down the center of the chicken, and fold over the sides to close. Truss the chicken roll with butcher's twine. Place in a large roasting pan, and season the outside of the chicken with salt and pepper. Roast, uncovered, for approximately 1 hour 15 minutes (prick the thigh end and check that the juices run clear, or wait for chicken to reach an internal temperature of 160ºF). Allow chicken to cool, then place in the refrigerator. Carve into slices and serve. Tip: Get your butcher to do the dirty work. Call in advance and ask the butcher to debone the chicken for you.